To learn how to “put up” some of their favorite recipes, read on. It’s a process that uses boiling water to destroy active bacteria in high-acid foods (citrus, pickles, tomatoes, etc. ), making them safe for later consumption. Here, Martha and Lee offer a quick overview, but check out their recommended reading (below) to learn more about this method. 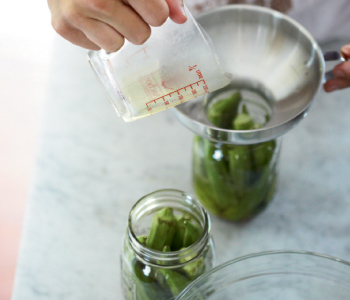 Clean jars in the dishwasher or place in water bath canner and add water; simmer 10 minutes. Bathe lids in hot water until ready to pack. Wash produce thoroughly. Prepare ingredients according to recipe. 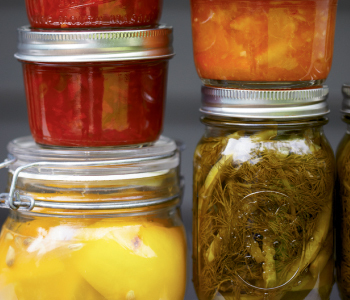 Add food to hot jars according to recipe and ensuring proper “head space” (space from the top of the jar to the food or liquid in the jar). Wipe rim and side of jar. Center lid on jar and apply screw band “fingertip tight” (as tight as possible without exerting extra force). 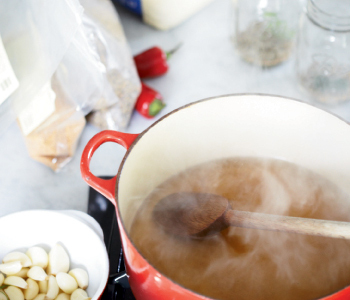 Remove jars and place on a clean, dry towel. 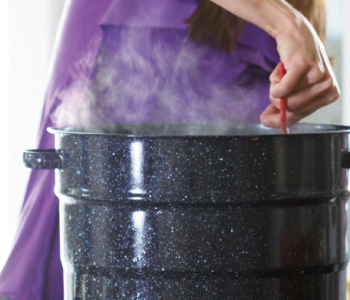 The lids should make a popping sound after a few hours, or after cooling overnight. If the center dents when you press on the lid with your finger, it has not sealed properly.